The participants of this intensive course will be joining a Novia course on monitoring technical and physical aspects in buildings (Byggnadstekniska och – fysikaliska mätningar). Through joint lectures, study visits and practical work the students learn more about indoor climate, fire safety and other physical aspects important in the maintenance of a building. The hands–on work will include registering damages in a selection of historic buildings, and finding solutions for putting these right through an analysis of the indoor climate. 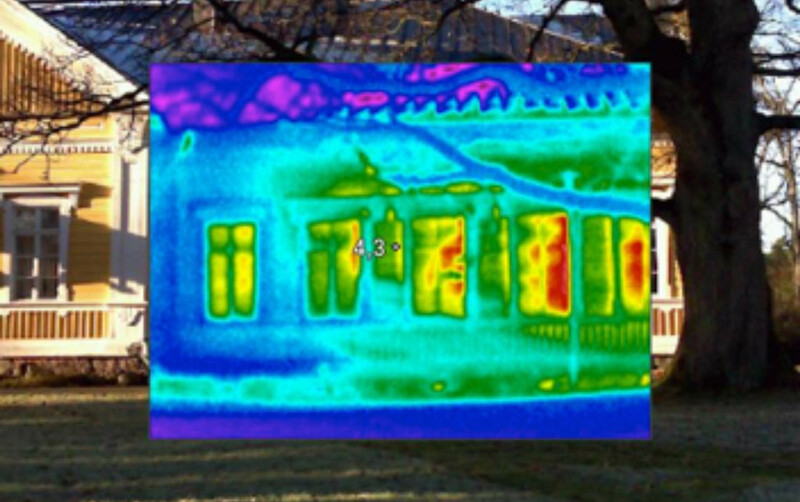 Students will learn to use measuring techniques and instruments, for example a thermographic camera, a moisture meter and more to interpret the results (see: thermal image of Seminar House). Practical work will take place in several buildings of historical interest in the Raseborg area in southwestern Finland. More details on program and dates by Towe Andersson, Novia University of Applied Sciences, Campus Ekenäs, email towe.andersson@novia.fi, phone +358 44 4498 261. Through lectures, study visits and practical work the students will learn about visualization and measurements, 3D scanning, instruments for monitoring structures and other physical aspects that are important for evaluating the condition of a building and planning the maintenance of a building. The practical work in Ekenäs, September 17–23, 2017, will include measurements, registering conditions and damages and finding solutions. Students will learn to use measuring techniques and instruments. Practical work will take place in one or several buildings of heritage interest in the Raseborg area in southwestern Finland. The intensive course will include making of an official report. This means some work in advance and some more work after the intensive week. All students of this course will officially receive 3 ECTS from Novia (diploma). Each university can then include this into ‘their own study plan’/selective course.